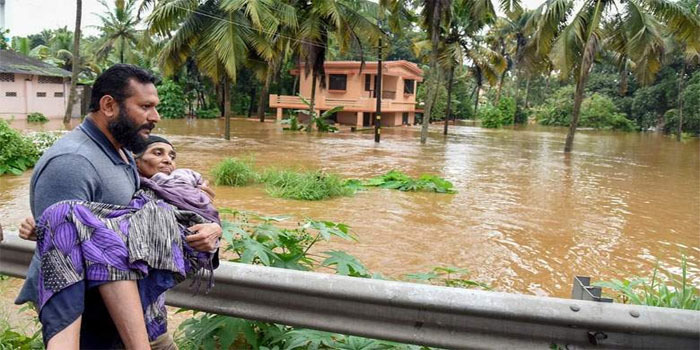 With no let-up in the torrential rains and flooding that is drowning Kerala in untold misery for the second consecutive week, UAE expats from the south Indian state are opening their homes and hearts to friends and neighbours in distress. Many expatriates, who own houses back home, are throwing their doors open for marooned families after their homes were submerged under water. “Anybody in trouble, Thrissur area, two or three of you can stay with us in our apartment. Pls call or msg me,” posted Praveen Menon, a Dubai expat, who is currently visiting Kerala. “There are lot of people stranded in bus stops and train stations in and around my home district, Thrissur. Transportation has come to a standstill in many places. So, people are looking for safe places as water levels are rising,” Menon, who works as Overseas Manager for Skyline Builders, told Khaleej Times. Ramesh Nair, a reception manager in Abu Dhabi, said his house in Neeleswaram, Kasargod is open for people who need shelter. “I can take in around 50 people. It is a three-bedroom house with three big halls and four toilets. There is a full-fledged kitchen and I am making arrangements to make sure there is enough grocery supplies for families,” said Nair. While thousands have been evacuated to government relief camps across the state, many are still stranded in remote locations where rescue and relief have not reached, according to volunteers on the ground. Another expat, Honey Bhaskaran, a writer and poet based in Dubai, said her house in Irutti in Kannur district, is welcoming people. “I have already informed volunteers in my area that we can accommodate around ten people in my house. I only have my mother and brother staying there,” said Bhaskaran, who is helping coordinate relief and rescue work through social media. “We are doing everything possible to help people. I haven’t slept all night flagging off distress messages to concerned teams on the ground,” said Bhaskaran. Kerala has one of the highest numbers of non-resident Indians and an estimated 2.8 million live and work in the Middle East. The UAE is home to around one million Keralites and many expats are worried about their family’s safety. The Cochin International airport, which announced it has shut operations till August 18, is expected to remain closed till August 26 due to rising water levels, upsetting the travel plans of many in the UAE. Santhosh, a businessman based in Dubai, said it is a personal tragedy to Gulf expats. “We are all affected in one way or other. We are doing our best to help,” said Santhosh from Perunadu, in Pathanamthitta district, one of the worst affected. “Two families are already staying with my mother in our house. We can take a few more people,” Santhosh told Khaleej Times. “Since today morning, I am unable to reach my wife’s family. Their house was completely submerged under water and they had moved first to a neighbour’s house and then to a government building,” said the businessman. “Access to many places are difficult due to landslides. Relief has not reached many and people are worried as they hardly have enough food to last two more days,” said Santhosh echoing the concerns of many others.